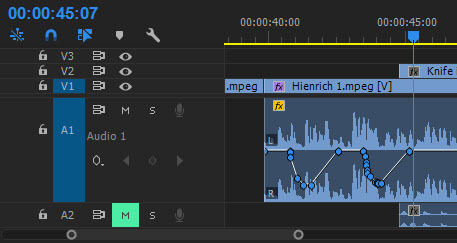 Following on from my previous post about using the keyframe button in Premiere Pro’s Audio Clip Mixer to animate your clips in the timeline (click here for the tutorial), there is a more advanced and helpful feature in the Audio Clip Mixer for dynamic changes to clip levels. This type of animation is ideal for ducking music under narration while playing through your timeline – or any number of other scenarios. However, it does take a little learning and like many things in Premiere Pro, there is a ‘gotcha’ that’s worth knowing about. Firstly, to do dynamic animation simply click the keyframe button, and then play the clip and simply pull the slider/panner as you need and this will create multiple keyframes. However, when you stop the default behavior is for the animation level to jump back to the starting point, which can make for jarring audio changes – something you probably don’t want. To overcome this problem there is a hidden option in the panel menu for the Audio Clip Mixer in Premiere Pro, which allows you to change from the jarring return to zero to a smoother controllable return which by default takes 1 second. Using this mode will ‘ease’ your animations so that instead of jumping back it gently returns to the starting point – which is probably exactly what you want! Simply click on those three little lines to the right of the panel name to find this option – you want ‘Keyframe Mode Touch’ for the smooth return.